I suppose that might be the right word for now. Bruce is going to have surgery (paraesophageal hiatal hernia repair and maybe another bit of patchwork) this week. I am not too concerned about the procedure beyond the fact that it is surgery and thus has its associated risks. Still, that moment when I take his wedding ring, put it on a length of yarn, and slip it around my neck is always tough. Once we make it through surgery, we have recovery, and it looks like it could be a bit bumpy. He will be on a pureed diet for four weeks after this, so the blender is in for quite a workout. There will be some other restrictions, too, but we are trying to not get ahead of ourselves. Coming up with some good recipes will be a challenge, too, but I have been looking at some possibilities. Our son is going to lend his VitaMix to us, so that will be helpful. Anyway, this is going to keep me away from the computer for a bit. Maybe I will have some scheduled posts ready to go, but I do have a few other things I need to attend to first. I have to pack for the hospital. That means deciding on some hospital knitting. I am thinking about hats, cowls and fingerless mitts, or maybe even some plain vanilla socks, but I really have not gotten much beyond those few stray thoughts. 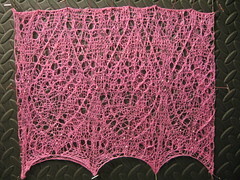 I am trying to not think about the lace shawl I agreed to knit for a stranger. That one is still a bit of a puzzler, and perhaps a story for another day. In the meantime, I have been knitting a cowl, ripping it out, restarting it, having a little bit of the yarndage, and finally finishing it. I had intended this to be a gift, but am afraid it might not be good enough. The pattern is Kuusk from the current Knitty. I am not quite sure what brought me to the pattern, but it was a good knit. I knew I might have yarndage issues, so I used beads instead of nupps. If I would have had (guessing here) another twenty yards, I would like this even more. However, it is still nice, and I enjoyed knitting with my handspun. 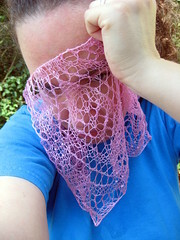 I also dyed the silk hanky before spinning it, so there's that, too. It was supposed to be purple, but the Wilton dye behaved differently than I had anticipated, so I ended up with pink. The little skein had been sitting around for months, and I am glad to have knit it into something. Since the modeled shot is a bit lacking, here is one of it blocking, and then a peak into my unconscious mutterings. A few years, ago the Mitered Square Sock Yarn Blankets swept across the kingdom of knitters. I saw them, admired them, and moved on with my life. While I think they are wonderful, I am not likely to knit one, but I probably have the yarn with which to make one happen someday. Somewhere in my mind, I do have an idea of knitting one of those blankets for myself one day, but not anytime soon. Now I see the HexiPuff Pandemic infecting one knitter after another, and I am just sitting back and watching the little hexagons form from the needles of other knitters. My risk of catching this one is very low, but I will enjoy watching what happens with others. Generally speaking, knitting blankets drains my already dwindling will to live. Although it is probably quite some time before I am likely to knit my own Mitered Square Sock Yarn Blanket, that does not mean I want to just let all of that yarn sit and wait. However, not having a project in mind meant waiting for a need to help me find one. I got a Kindle, and it needed a protective cover. I searched on Ravelry and decided to make this one. My sister also has a Kindle, and hers needed a case, so I made one for her. I added i-cord to the top and as a button-closure. I also lined them with some fabric I had lying around. I adore these little covers, and absolutely love my Kindle! I think I might need to make more. Seeing as this week's weather has already given us back-to-back <90F temperatures, (we'll not speak of the rest of the week) it seems like the time is right to knit mittens. I have been contemplating colorwork lately, and this is the perfect excuse to play. As I was going through my books the other day, I found several motifs that I would like to put together into mittens of my own (for lack of a better word) design. I don't know that I will ever get around to it, so for now I am knitting from a pattern. 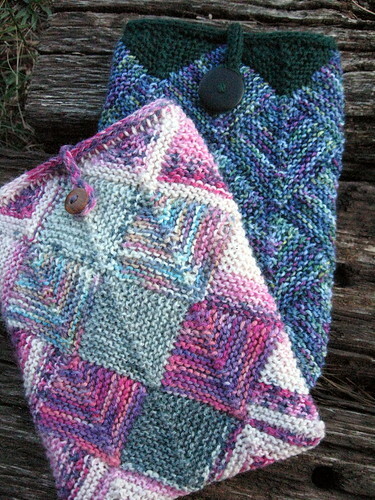 It is already take two for this pair of mittens, as I did not like the way the colors were working together. You can see how some were just blending into the background, so I had to rip. I am not sure whether I like the re-start, but since I am having difficulty liking anything right now, I am going to keep going. The pattern is Sea Mineral Mittens from SpillyJane. I am changing the thumb because, although it is very attractive in this design, the peasant thumb is a bit uncomfortable for me. Tomorrow includes time in the car and in the waiting room, so I would like to have my knitting settled and ready. I figure that if I can make it through the cuff and the gusset and place the thumb stitches on waste yarn, I will be set. Knitting the second Emily2 was more challenging than knitting the first. To begin with, there was the issue of locating a steel crochet hook small enough to add the size 11/0 seed beads. It also took some time to get used the unusual yarn I chose. I decided to use the copper/bamboo yarn I got at Habu Textiles last year. It is so very fine and light that it almost seems to be floating away while you knit with it. Not only is the yarn itself very thin, but the ply of copper makes for a very different knitting experience. Now, none of this is bad. I loved knitting this, and each of the challenging elements added to my enjoyment. There are only two more challenges remaining. The first, I do not believe I can conquer with my current skills--getting a decent photo. That did not stop me from trying time after time. The last challenge is deciding whose this is. Last month I met with other spinners at the lys. Someone mentioned a shawl I had once knit, and someone else asked what my current shawl project was. I got out the Emily2 in progress and handed it to her. Other people were interested to see it and feel the unusual yarn, so it made its way around the room. I said to the woman sitting next to me that I was not sure whether I was giving it away or keeping it for myself. She stated that no mortal alive was worthy of this shawl. I guess that disqualifies me, too.